From our neighbors at the Dole Nutrition Institute comes helpful information about a healthful summertime dining option. This article was published originally on dole.com. Bagged salads are just what you need when you have unannounced guests or for those times when you just don’t want to turn on the oven. It’s the one item that should always be in your fridge so you can take advantage of recipes like our Chipotle Spring Rolls, a real crowd pleaser! This month we’re setting the record straight on this mealtime shortcut by answering your questions and addressing concerns about bagged salads and salad kits. We turn to experts, Mary Ann Lila (MAL), Director, Plants for Human Health Institute at NC State, and Aaron Schneider (AS) Director, Food Safety at Dole. Q: I’ve heard that salads lose minerals and vitamins, specifically B vitamins like Folate and C, when they are chopped, washed and bagged. As a mom, I’m worried that my go-to salad is not a nutritious choice. Am I taking the easy way out? 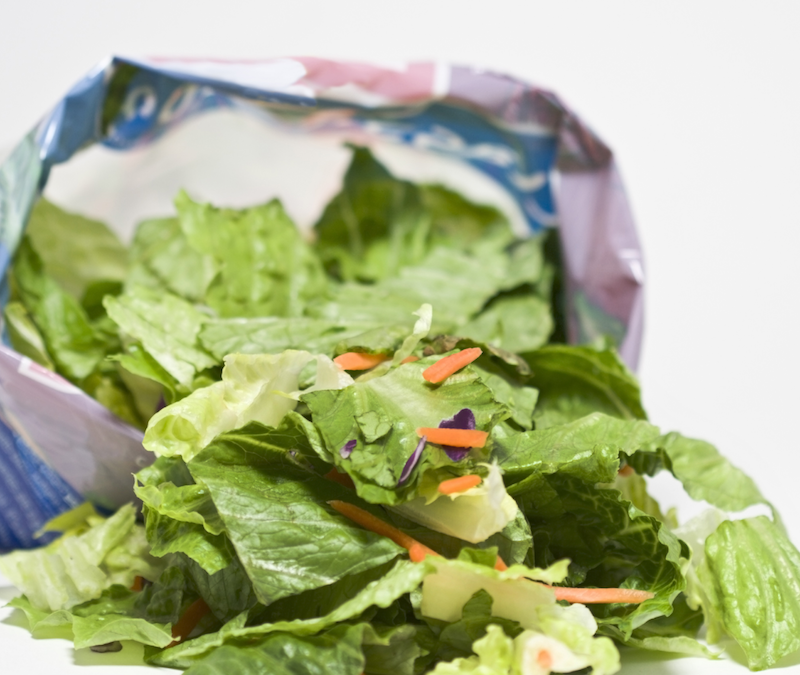 MAL: Bagged, prewashed salad greens are an excellent and health-protective choice. The salad greens are not only an excellent source of fiber and nutrients but also a superb resource for extra-nutritional phytoactive compounds that specifically help to attenuate chronic inflammation and are preventative against a range of chronic diseases in humans. There is a minor (really minor) loss of some water soluble vitamins from cut or torn surfaces, however the professional packaging process minimizes these losses. It really comes down to the difference between eating health protective produce, or not. If the ONLY alternative was a loose bunch of greens (which might have mud embedded in the interior, or critters), then there are a lot of people who just would not bother to even buy it. The packaged greens make it easy, prewashed, fully crisp and fresh, and a no excuses way for families to easily get the greens into the daily diet. Q: I like the convenience of bagged salads but when I am trying to provide my family with the most nutritious option, should I just make the salad myself? MAL: Honestly, I find that the bagged salad greens, which have been very carefully and gently washed and packaged, last longer than many of the loose produce items that can be purchased in grocery stores. Very often when loose spinach or Romaine is purchased, the leaves tend to turn rapidly and the wilted leaves more quickly decompose than those which are carefully bagged at the height of their freshness. Q: Pre washed salad blends are so convenient, what are your best practice suggestions for storage and use once salads are brought home? MAL: Plan to eat them in a timely manner – within a week. Actually this is yet another advantage of the packaged greens, in that the appropriate volume of greens can be purchased rather than having to buy a big bunch of spinach or head of lettuce that can’t be consumed by the family in a reasonable amount of time. AS: Store in refrigerator with a set point below 40F but, above 32F. Once bag is opened use within a few days. Q: Will I get sick if I eat lettuce once it has begun to brown? AS: Best to consume product prior or up to the Best If Used By (BIUB) date, not beyond. Browning or other defects can be indicative of quality challenges with product or cold chain integrity loss through distribution. I wouldn’t suggest that having sporadic brown pieces (defects) has a relationship with illness. Q: What is Modified Atmosphere Packaging (MAP), should I avoid it to do what’s right for my family? MAL: Why avoid it? It is simply a smart technique to extend shelf life of produce. Again, the leafy greens are minimally processed – they are fresh produce – so gas flushing/ or reduced oxygen at the time of packaging just helps to preserve the fresh, crisp texture and delay wilting/prevent deterioration. The oxygen/nitrogen/carbon dioxide atmospheres used in MAP are all natural components of the air we breathe. The gas blend simply helps to maintain the natural metabolism/respiration of the leaves. (Which is all natural, all good). AS: Additionally, once a package with MAP is opened, any modified atmosphere is lost and exposure becomes simply ambient air which we breathe. Q: Are the nutrition facts on the back of the salad bag accurate if vitamins and minerals are being lost during storage? MAL: Again, the losses are negligible. The greens in the package are not shredded into bits, they are largely intact leaves with all the nutrients preserved. Q: Does my choice of salad dressing matter? MAL: Of course in terms of caloric count, the greens are low calorie and will “fill up” the stomach cavity and give a person satiety (the feeling of fullness) without loads of calories. If they are swimming in ranch dressing, well, the greens still have all the active compounds but the calorie count has risen dramatically. Even so, EAT THE GREENS! Much better than eating chicken wings with the ranch dressing!